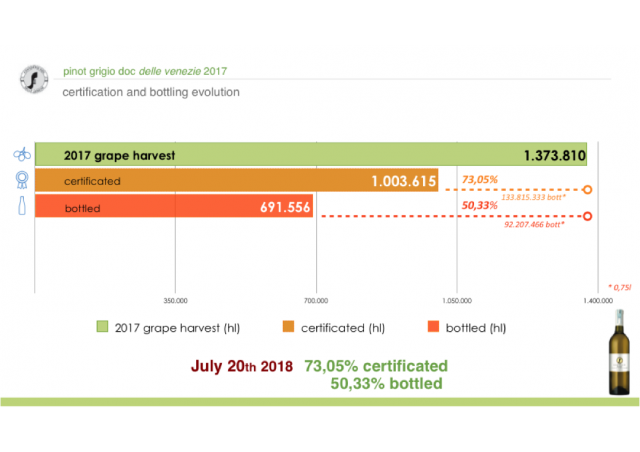 Figures from the first six months since the creation of the Pinot Grigio delle Venezie DOC have yielded “excellent results” with over one million hectolitres of certified wine now recorded. Figures revealed by the newly formed DOC show that the requests for certification rose by 73% in the 2017 vintage and bottling by 50%. In addition, from 1 August, Pinot Grigio grown in Veneto, Friuli and Trentino-Alto Adige can no longer be bottled as IGT. Over 130 million bottles of Pinot Grigio now have DOC status with the production zone now expecting “zero stock” before the end of December 2018. President of the Consorzio delle Venezie DOC, Albino Armani, commented: “The positive signs that come from the market, confirmed by the growth in the demand for certified products – which has exceeded one million hl – and bottled, invite however to maintain a balanced attitude towards the future. Looking with extreme care and sense of responsibility for the forthcoming harvest, which is expected to be richer (+ 20%) – basing on the results of the technical-economic report elaborated by the Interdepartmental Center for Viticulture and Oenology Research University of Padua, ‘CIRVE’ – this promises a development of the appellation that will be governed in order to maintain the balance and stability in tradings”. The consortium has also sent the Trento, Friuli-Venezia Giulia and Veneto regions a formal request to moderate the release of Pinot Grigio produced in 2018 “in a manner consistent with the evolution of the demand”. It added that storage that the release will start no earlier than March 2019 and may continue until 31 December 2019. President of the Wine Group of Unindustria Treviso, Ivo Nardi, spoke about the move: “The industrial sector looks with optimism at this decision. This absolutely is a measure required by the supply chain to ensure the market a necessary tranquility and to defend the product from marked price fluctuations, necessary conditions to continue the process of enhancing the young appellation”. “It is undoubtedly a necessary and far-sighted measure”, added Dario Ermacora, regional president of Coldiretti Friuli Venezia Giulia. “Coldiretti appreciates and supports this decision that aims to defend farmers’ income by recognizing their work in an area where the cultivation of the grapes of an appellation which is successfully establishing itself in the world”. Armani concluded: “I think it is useful and appropriate to activate the storage for a specific quota equal to 20% of the production expected for the next harvest – a measure that the supply chain as a whole has requested with the aim of managing in a coherent manner the product volumes that will be obtained with the harvest, in the interest of improving and stabilising the functioning of the market of our Pinot Grigio delle Venezie DOC”.